Here is a toolkit to attract, hire, and retain persons with disabilities. The recent data that delves into the employment data of persons with disability is Census 2011. Unfortunately, in India, there are no regular studies, or surveys conducted that measure or capture the employment data of persons with disability. According to Census 2011, 63.66 percent of the disabled population is not working compared to 60.21 percent of the able-bodied. The average employment rate of people with disabilities is 0.28 percent in the private sector and 0.54 percent in the public sector. Additionally, 87 percent of persons with disabilities in India worked in the informal sector. The International Labour Organization (ILO)'s 2011 report 'Persons with Disability and The India Labour Market: Challenges and Opportunities' states that 73.6% of the disabled in India are still outside the labor force. Of these, those with the mental disability, disabled women and those in rural areas are the worst neglected. While some employers have recognized the potential that people with disability can bring to the table, several others still have concerns and doubts that prevent them from tapping into this vast pool of resources. Lack of sensitivity and awareness has been one of the most significant hurdles in promoting employment opportunities for people with disabilities. Dorodi Sharma, Disability Rights Specialist at United Nations India shares, “Disability is looked up as a medical or charity model. We have not been able to see disability as a part of human diversity. We need to see disability as a human or social issue and not a charity issue.” She added, “We already have pre-conceived notions around disability like- a person with a disability would not be able to withstand the pressure of a job, it would be expensive to hire a person with a disability, it will affect the productivity, etc. These myths can only be addressed by creating awareness and sensitivity among the organizations. 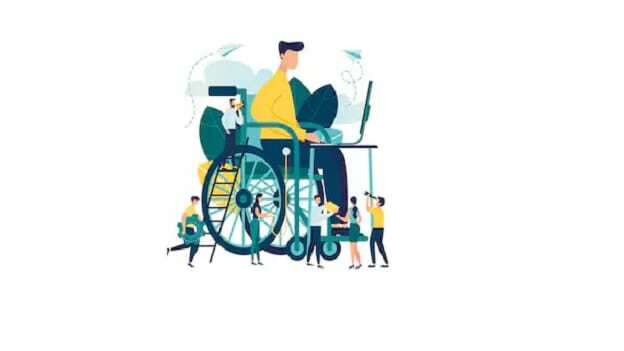 Socio-economic hurdles: According to Census 2011, 45% of India’s disabled population is illiterate, and the dropout rates for physically challenged students is equally high. A 2014 ‘National Survey of Out of School Children’ report put the number of special-needs children between six and thirteen years of age who are out of school at 600,000. This disheartening situation is due to a number of reasons which ranges from lack of conducive environment and empathy to the lack of infrastructure and special teachers. Ill-equipped public infrastructure facilities: Inaccessibility to infrastructure, transportation, tools and equipment to perform their regular tasks and jobs restrict persons with disability to take up jobs. According to Svayam report, that conducted an accessibility audit of buildings and public places in 2016 as a part of Prime Minister Narendra Modi's pet initiative Accessible India. The report revealed the appalling state of infrastructure facilities for differently-abled in public buildings, hospitals, railway stations and educational institutions, and half-hearted attempts at building ramps in the name of accessibility. Mindset challenge/Socio-cultural acceptance: According to “The Persons with Disability Act, 1995”, the Government of India has provided with 3% reservation in public sector jobs. But a study reveals that companies are not even able to fill these seats. The lack of accountability and failure to identify jobs accounts for this lag in employing such talent. “There is a dire need for a firm anti-discrimination policy to be put in place that will make Indian companies accountable in employing PWDs,” shared Abidi. The data and statistics are enough to indicate that there is a huge talent pool in the market that is still left to be tapped. The need of the hour is to shift our hiring plan from a corporate social responsibility to a hiring plan that creates business impact. People Matters researched and interacted with industry experts and disability rights specialists to bring you a toolkit to tap this pool of talent. Here is how you need to hire and create a culture that is inclusive to persons with disability. A common notion that exists within society is that an “x” type of disabled person cannot perform a “y” type of job. Specific jobs have been identified as the jobs that can be performed by a blind person and not by orthopedically disabled person and vice-versa. We readily categorize people on some characteristics and make generalizations about them. However, the biggest flaw with this approach is that it does not give a person with disabilities a choice to demonstrate their capability to perform a job of their choice for which they might have requisite skills. Lack of skilled and uneducated proportion of candidates with a disability is very high and hence, finding the right candidate for the right job becomes difficult for HR professionals. During our research and various interviews, we found that NGOs are the most sought-after options when it comes to hiring people with disabilities. E.g., Pankh, a collaboration between Trust for Retailers & Retail Associates of India (TRRAIN) and Youth 4 Jobs Foundation (Y4J). The organization offers a comprehensive 60-day training program, which includes trade specific training as well as training in life-skills, soft skills, and spoken English. Students spend the first 45 days sharpening their skills in the classroom. The last 15 days are spent applying their theoretical knowledge to practice with on-the-job training. At the end of the program, Pankh organizes campus recruitment and helps facilitate placement of all students. During our research we also found various online job portals like disabilityjobs.gov.in, Jobability.org, etc. that matches job seekers from people with disabilities with job vacancies, placements, and resources. Start with auditing your workplace and identify the access areas that can restrict the participation of people with disabilities. You can reach out to professional organizations which provide access audit services. However, audits done by NGOs and disabled person’s group can give a right user perspective. The work environment and work system need to be accessible for all employees. Mobility and transport services, clients and customers, safety measures, physical access to buildings, washrooms and disability friendly two-way communications, etc. contributes to making a company genuinely inclusive. Earlier People Matters brings you a series of case-studies of companies like IBM, Lemon Tree Hotels, and KFC to help you in understand the various challenges that the companies go through in attracting persons with disabilities and the best practices that were implemented in hiring and retaining persons with disabilities. This article was an analysis based on the case-studies and interaction with various experts in the industry.